From Blasters to Phasers: How Close Are We to Laser Guns? Laser guns have been the go-to staple for far-future science fiction for decades. Be they actual lasers or particle-beams that produce an energy pulse visual, they've rendered our movie and video game sci-fi battle scenes more seizure-inducing than a European night club. Directed Energy Weapons have been a focus of military research for some time, but just how close are we to actual, handheld laser guns, and how faithful will they be to their fictional portrayals? The most common types of laser guns in fiction can be divided into two main categories, which we'll call the phaser and the blaster - any aficionado of sci-fi knows where we're going with this. Popular in older sci-fi, the phaser, as seen in Star Trek, fires an uninterrupted beam of light that strikes a target near-instantaneously. But the phaser-style of laser gun has fallen into disfavor in the last couple of decades, being replaced with the far more cinematic blaster, which fires a discrete package of "light" or illuminated matter that can be observed as a distinct projectile. 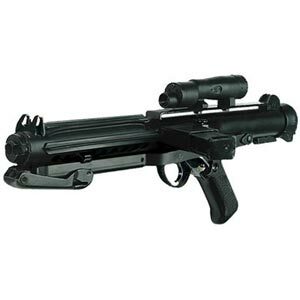 Star Wars popularized the blaster, so much so that even the new Star Trek movies have adopted the visual style. While the official canon of both Star Trek and Star Wars describe - in painstaking detail - the fictional mechanics of their respective weapons, we're going to base ourselves simply on their most commonly observed characteristics and whether our current technology can replicate the results. Guns fire bullets. Bazookas fire rockets. Laser guns fire... lasers, right? That's the idea, at least. The projectiles that issue from phasers and blasters have distinctly different qualities which form the core difference between these two weapons. We'll call a phaser's projectile a beam and the blaster's projectile a bolt. The difference between a beam and a bolt is presented most simply in First Person Shooters. 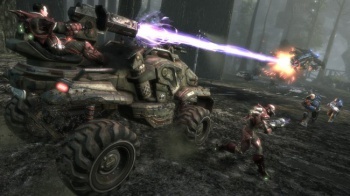 Typically, futuristic FPS games such as Unreal Tournament feature weapons that can be divided into two groups: projectile and hitscan weapons. With a hitscan weapon, the moment you click "fire," the computer calculates a straight-line path, and the nearest object that intersects that path is struck. A projectile weapon, on the other hand, fires an object that travels through the air at a given velocity and - if the game's physics are good enough - has a ballistic trajectory. The distinction between hitscan and projectile weapons in video games is effectively the same as that between beams and bolts, for our purposes. When you aim a laser pointer at someone, the beam strikes the target instantaneously - or at least, near-instantaneously, since even light has a velocity. Put simply: a beam cannot be dodged; a bolt can be dodged, if it is traveling slowly enough.